Radical disruption and change is the nature of the triple conjunction of Uranus, Ceres, and Eris in retrograde. Let us affirm that wisdom and respect for all carries the day. Election day voting polls open at 7 am on November 8, 2016, Washington DC, with the transiting moon in Aquarius. It closes at 7pm with the transiting moon newly into Pisces. The Aquarius moon is quite appropriate for a political event. As the last aspect before leaving Aquarius (a few hours before the polls open), the transiting moon will form a sextile to transiting Venus in Sagittarius. This Venus in Sagittarius/Moon in Aquarius aspect describes the high-volume voting; also, the pre-election day cash-in and the swings to the extremes that have already occurred. It describes the issues that have been overplayed or exaggerated throughout the campaign, especially the late breaking email controversy (Aquarius) that have surprised both voters and candidates. While the late FBI email investigation bombshell has stirred it up, the fact that the election polls open on a void-of-course moon in Aquarius can suggest that while disruptive, this latest controversy will not prove effective in completely overthrowing/decimating the momentum that was already in place before the hand-grenade was tossed. (Traditional Horary astrology would consider a void-of-course moon as nullifying the question or event, as inconclusive, or as having no impact). The moon sextile Venus aspect puts the attention on the female candidate and on controversial (Aquarius) issues that have made this election such a wild-ride. Venus in Sagittarius is in mutual reception with Jupiter in Libra (in each other’s signs). Major shots have been aimed at trust and truth. Venus/Jupiter raises the voice regarding the feminine issues – the need to be heard, respected, valued, validated, and honored – that Trump has inadvertently made so front and center throughout this election. As the moon’s last aspect before leaving Aquarius, this moon sextile Venus imprint is an indicator of a new social voice on the rise. Venus in Sagittarius is very focal about ideas, opinions, and rights. Throughout the campaign, we have witnessed much targeting, outspokenness, and fault-finding from both camps. Saturn in Sagittarius holds tight to its justification, conviction, sense of rightness, and its sense of righteous indignation too. This planetary influence is not above presenting a one-sided and/or distorted version of the truth to stack its end game. In its pure form, Saturn in Sagittarius uses the advance of time to test, hone, and prove beyond a shadow of a doubt that which has come under question. Venus and Saturn in Sagittarius suggests that the election launches a significant new pathway for each. Each candidate has a major uphill climb to do too. A new level of trust will need to be earned. It is a monumental task and neither candidate can afford to waste time or scrimp on effort. We are likely to see both hit the ground running after the election. By stirring up the angry mob, Trump has served as the collective shadow’s spokesperson. The triple conjunction of Uranus, Eris, and Ceres, all three travelling in Aries and in retrograde motion, also keep the anger, the fight, the in-fighting (Aries retrograde) and the political strife alive. Relative to Mars, ruler of Aries, culminating at the very last degree of Capricorn, and dispositor of Uranus, Eris and Ceres, these planetary influences can suggest a pressurized valve that is ready to hit its trigger-release. The moon’s transit through “anything goes” Aquarius (November 6 to 8) and the after-election transit of Mars into Aquarius are surprise and shock-wave influences. The transit of Mars, culminating in Capricorn, directly opposes the planetary north node of Saturn (ruler of Capricorn), while the transit of Saturn in Sagittarius directly opposes the planetary north node of Uranus. While Mars at the aneretic degree (last degree of a sign) is generally considered a weak influence by traditional astrology standards, the oppositions to the planetary nodes suggests otherwise. Note also that Mars is exalted in the sign of Capricorn, which means Mars can optimize Capricorn’s attributes. Mars in Capricorn is an executive control, “use whatever force is necessary to get the job done” archetype. At a broader symbolic level, Mars at the very last degree of Capricorn underscores this election as notable seed event for collective evolution, especially regarding the nature of judgement patterns and conditionings that have created the social distortions that are so common place in today’s reality base, i.e. gender, sexual, national, social, and race disparity and denigration. Taking it to the airwaves, and the streets, Mars can trigger a significant backlash or aftershock, especially once it unleashes in Aquarius. Mars enters Aquarius three hours after the voting polls close. 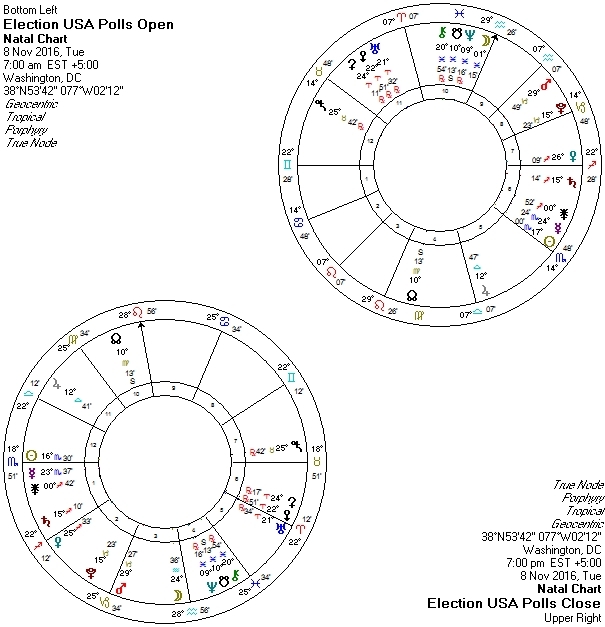 Emotional floodgates are sure to open as election day ends with the transiting moon newly into Pisces, at the Midheaven and on its way to forming aspects to Neptune, the south node, Chiron (conjunctions) and Saturn (square). The transiting moon on the Midheaven is a results significator. It is also the trigger for Neptune, ruler of the south node in new phase to that south node. The transit of the Pisces moon on the Midheaven, Neptune, the south (and north) node at station, and Chiron in Pisces has the world watching. Nothing happens in isolation; what affects one, affects all. As a work in continuous, fluid motion, these Pisces influence stirs the tides of the collective consciousness and desire. As this process evolves, it simultaneous gives shape, form, and dimension to the potentials that have reached their ripe and ready timetable. As an archetype, Pisces unlocks hidden wealth for collective application, for collective learning, choice-making, and evolution. This election is a national one, but what it launches reverberates throughout the political world and the collective consciousness. The event is actual, but it is also infused with great symbolic and karmic relevancy. In addition to tapping the resources of the collective, Pisces is an archetype of unresolved anger and rage. The advance of Mars into Aquarius just after polls close, along with Venus in Sagittarius in disseminating trine to Uranus (disruptive), Eris (anger; discordant) and Ceres (battle for sovereignty), travelling retrograde in Aries, can also spark large scale protests, rebellion, and perhaps even wide- spread violence. The transiting moon in Pisces indicates an iconic moment for a chosen one, and for the seed of a majority-rule collective trend to set itself into motion. Will the outcome prove to hold a saving grace, or will something of great importance be lost? The Pisces moon can stir great hope or great collective disillusionment. The ocean knows no boundaries when its emotions are unleashed. Regarding a backlash, the transiting moon’s early degree (0:41 Pisces) suggests that what is unleashed may not be effective enough to make reverse the tide’s direction, but while it is stirred up, it certainly can cause further loss or destruction. Watch for the fallout to continue and to shift through the following full moon week. (November 14 delivers a super full moon in Taurus, November 17, Ceres and Eris conjoin, and November 19, Neptune stations direct. 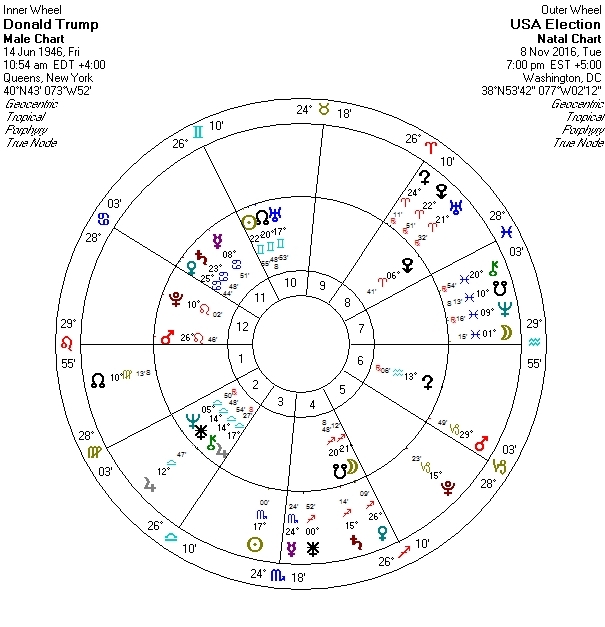 Viewing the November 8 election chart as a general transit, note that the transiting Aquarius moon has just created a first-quarter square aspect (decisive; activation) with Mercury at 23 Scorpio. This aspect is notable for two reasons: 1) Mercury is the ruler of the north node in Virgo; 2) Hillary Clinton’s south node is 23 Scorpio. A planet transit to south node can ignite one of 3 conditions: relive, fruition, or relive and fruition. It suggests that Hillary taps innate resources and past life resources of particularly significance. The transit of Mercury on her south node also identifies this event as a key synthesis or trigger moment to bring something from the past forward into the present. 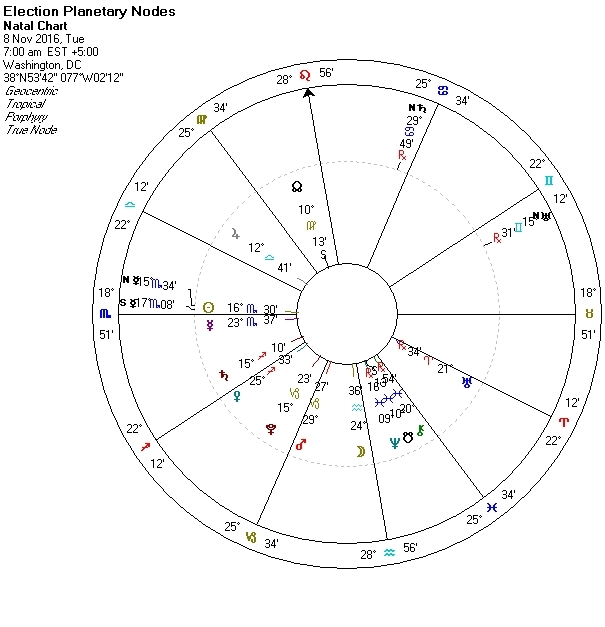 This event chart Mercury contact to her natal south node (a karmic point) describes the late announcement by the FBI of the renewal of investigation into Hillary’s emails on an insecure server, which is seen by many as ploy to overthrow Hillary (Mercury in Scorpio: sabotage, manipulation, hidden agenda, trust violations, emails, key players). The event Mercury contact to Hillary’s south node marks her not only as a key target, but also a key agent for the collective. It also suggests this event as a major personal karmic catalyst. The end of polling at 7pm Washington time puts the transiting Moon, now in Pisces at the Midheaven. 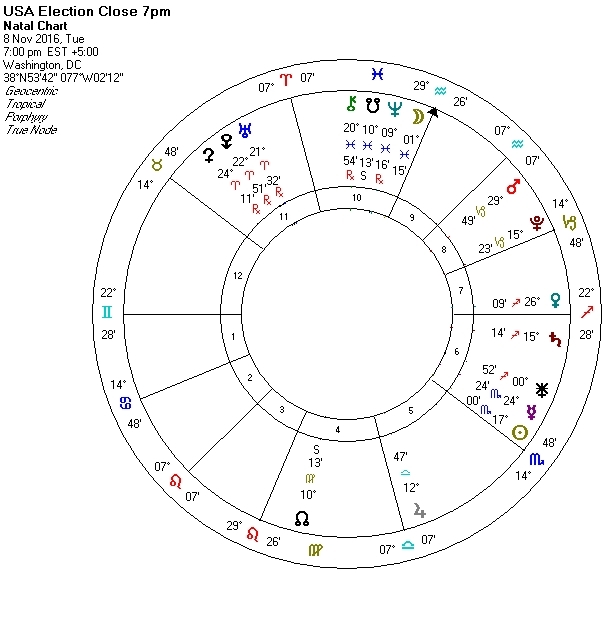 The event chart suggests an uncertain-to-the-very-end, yet pivotal and iconic (Pisces) result. The moon’s first aspect is a square to Juno in Sagittarius. Juno suggests a karmic contract brought forward from the past, that is key and relevant to future, that is on a continuance program. As an unleashing aspect, this Moon/Juno aspect can be an indicator of a significant emotional floodgate. When Juno is unhappy, she is capable of great vengeance. She will not be denied her rightful dues. The moon’s dispositor is Neptune in Pisces. Neptune holds especially significant sway for several reasons: 1) it is in its own sign; 2) it is the ruler of the transiting south node; 3) it is culminating on the south node: 4) it is the dispositor for Chiron in Neptune. Pisces is the archetype of mass consciousness. Regarding the personal and collective, the Pisces archetype correlates to: unlimited potential; the search for higher/ultimate purpose, value, meaning, and ideals; mass consciousness and trends; iconic moments and people; collective/social service, purpose, sacrifice, and salvation; hope; fulfillment of the dream; illusion, disillusionment, loss. The one chosen has an opportunity to advance a key personal evolutionary track and to also serve as a translator and navigator for the newly evolving collective voice, needs, values, and trends. This last statement is true for both opponents, but each has their own unique path to serve. (Pisces, the fish, swim in two different directions.) As another seed event of many that have come before and many to follow, Hillary’s election to top office it is yet one more opportunity for the collective to accept and support the ongoing resurgence of the sacred feminine, a program that advocates “stronger together”, or in other words, sharing, caring, and inclusion. Donald’s election to office is an opportunity to radically disrupt/overthrow the status quo. In so doing, he serves to accelerate collective evolution, through the shattering, perhaps through the cataclysmic experience. He has splintered the Republic party and he has used social divisiveness as a tool to advance collective reckoning. By exposing the collective to their shadow, this critical mass event serves to brighten the light of the collective consciousness. While karmic implications are indicated by all the transits, the transiting moon in Pisces also speaks of potentials that have not yet taken definitive shape. It remains to be seen how the seed is watered, tended and grows. Those with soul path of Pluto in Leo in the 9th house have an innate sense of a special destiny at the core of their being. The ninth house archetype references a long journey that has sought to create, explore, and self-actualize through the vehicle of belief systems. Strong willed, ambitious, driven, and tenacious are words used to describe Hillary. These characteristics also describe the soul’s fixation and all consuming drive toward fulfillment of higher purpose (12th/9th house. The intensified desires and ambitions created from deep within her soul consciousness will push Hillary to directly confront to provide opportunity to transcend whatever fears, insecurities, consequences of the past and present life challenges may be in the way, this in favour of the objectives put before her. Such drive and singularly focused intensity will mark her for life achievements of significance. It has been said that Hillary is innately shy and has felt uncomfortable with public speaking. A Scorpio, and even more so a 12th house Scorpio, covets privacy over the spotlight. Still, Hillary is not destined to sit on the sidelines of life but to be a public figure, a full participant, a creator as well as a responder. Her personal/soul purpose is merged with collective purpose (Sun/Pluto 12th house/9th house mutual reception) leading her to social leadership roles (Leo 9th house). Despite whatever opinion or policy changes she has made during her lengthy career, she has stayed fully committed to public service in politics and to her personal life values. Although she calls herself a Methodist, she does not openly display a practicing faith, but rather holds true to personal and private philosophies and principles. As Scorpio born will know, it’s all or nothing, all in or all out, and all the way always. The mission for this 12th house Scorpio sun is to fulfill an ultimate ambition, to be the most and the best she can be personally, to use her innate resources and talents to the maximum of her potential. The search for an ultimate career or path of service is a twelfth house archetype. 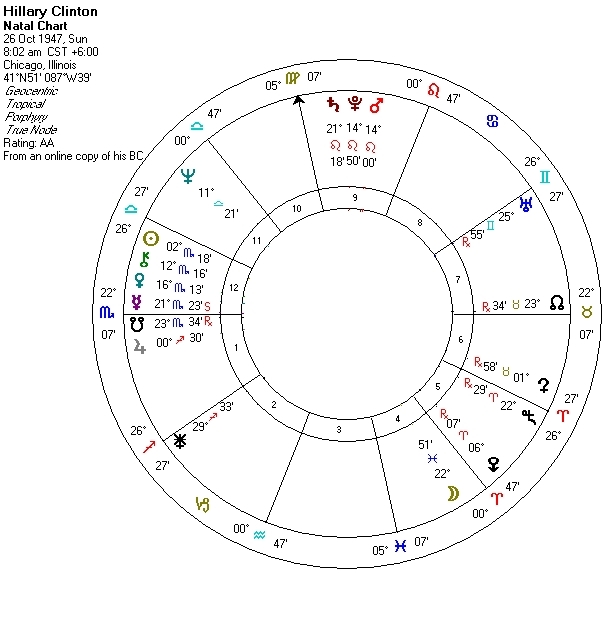 Note the ruler of the Virgo Midheaven is Mercury at station retrograde and rising (on the Ascendant) in the 12th house. This intensifies the drive to accomplish the goals set by her soul. Among the top of her soul’s desire and priority is perhaps one that is perceived as an ultimate path of service. Her soul is deeply motivated, all consumed, even fixated (Scorpio) on her chosen objective, that of manifesting the as-of-yet unrealized potential or dream. With Virgo on the Midheaven and its ruler Mercury at station retrograde in the 12th house, she is likely to feel that she has unfinished business to tend to. This sense of unfinished business also links to her subconscious programming/motivation regarding a sense of special mission, purpose, and destiny. With Virgo on the mid-heaven, a sense of added anxiety and necessity accompanies the drive toward the fulfillment of purpose. Virgo on the Midheaven also indicates feelings of inferiority or sense that she must work harder, fight harder for every gain. She seems to attract plenty of blame, public scrutiny, and animosity. Mercury stationed retrograde less than one day prior to birth is suggestive of an intensified focus on continuing along an already established path or program, to revisit something that is of primary importance, a soul priority; to transcend the limits or limitations of what has been experienced in the past. Any natal planet at station is a magnified influence. Mercury in Scorpio gives Hillary a sharp, intelligent, quick mind. Her penetrating mind can retain information and grasp deeper implications. She can readily understand how the system, concept or rationale works, and can intuitively strategize and/or see the weak links in an argument or body of information. Mercury in Scorpio station retrograde also suggests the soul is focused on revisited key matters from past lives and will set up specific events, circumstances and relationships in this life that will serve to promote evolution. At the core of that ultimate ambition or ultimate sense of purpose, etc. is a belief system rooted in a sense of special destiny (Leo/fire archetype). Deep within her consciousness, Hillary is likely to feel that her special destiny marks her as a spokesperson and/or role model and leader, one who feels she knows (from deep within her heart) what is in the best interest of those she loves and those she serves. She will embark on creative self actualization with purpose (Pluto; Saturn), pride (Leo), and zeal (Mars), this regarding her own sense of accomplishment, and with purpose and zeal for the world at large, especially the select super power nation she has been born into (nationalistic pride represented by Leo 9th house, 12th house Sun in Scorpio mutual reception with Pluto in Leo). At the core, she will have a sense that she is destined to lead or to champion an ideal, a social cause (12th house) and a social collective (national and world). Her belief systems relative to the 9th house would suggest she feels a strong sense of knowing what’s best, highest, and true in terms of the needs of the collective (12th house). Through her political ambition she has made it her own personal ambition to further policies and laws that will elevate opportunities for the people she represents. 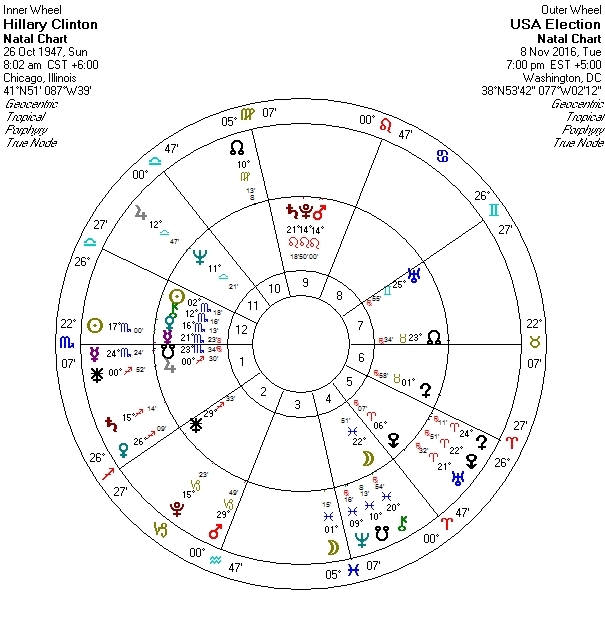 Her 9th house Leo (Mars/Pluto & Saturn) is a statement of Hillary’s nationalism, of her national pride, of her desire to lead the most influential/powerful nation of the world. Sun in Scorpio relative to the 9th house soul path indicates a desire to resurrect or relive something of special significance to her personally. It is also a suggestion of a legacy connected to her public service/sense of special destiny/purpose that she wishes to keep alive. Universal health care, women’s rights, better quality of life for the under privileged and free college education (a 9th house archetype) are initiatives she has been passionately pursued, even trail-blazed. Health care, women’s rights, raising the quality of life for the average American are causes she has fought for with great tenacity. The sun and Pluto are in mutual reception. When two planets are in each other’s signs, they double/unite their resources pool, which loans more potency and power to each. While Pluto in Leo in the 9th house likes to broadcast itself, the sun in Scorpio in the 12th prefers to keep it under wraps. The aspect is a last quarter phase, which is indicative that Hillary is more than we see/judge. Mars is in balsamic aspect to Pluto, at less than one degree from completion. This aspect is indicative of the soul at a stage of completion regarding a specific soul agenda/exploration. It positions the current life at a primary gateway, suggesting it is a primary lifetime for Hillary in terms of completion of a bigger picture cycle of soul evolution. At the same, the current life also represents a potent seeding time for a future undertaking. Additionally, Mars is in balsamic aspect to Saturn while Saturn is in new phase to Pluto. In Leo and in the 9th house, Mars/Saturn is exceptionally objective-focused and goal driven. This aspect intensifies resolve, staying power, and the desire to see it through to the end. It is also one that can achieve results, reward, status, or acknowledgement early on (Mars) and/or later (Saturn) in life. Mars/Saturn is indicative of achieving/holding positions of power or prominence. She has been a lawyer (a ninth house archetype), a senator, a secretary of state, a first lady, and now the president of a powerhouse/super nation. As secretary of state she has had to deal with military matters (Mars/Saturn) and has travelled extensively. Mars/Saturn is also a signature for life situations and tests that require great stamina and endurance, on the physical, emotional, and ideological levels. She has been a tireless fighter for the causes she has believed in and she has managed to surpass gruelling schedules and great scrutiny regarding her choices, actions, integrity, and honesty while holding public office, and while her husband held office. We can only assume that it took herculean effort to maintain control and composure while suffering the public humiliation of her husband’s infidelities while in office. Saturn/Pluto loans Hillary the ability to zero in on the bottom-line of issues, to get down to brass tacks. It loans her serious intent and the ability to stay fully committed to her mission, to that that which she believes in. She will defend what she believes is right, true, and necessary. This is also a proprietary combination. She will believe in owning what she feels is legitimately hers. By extension, it also speaks of her national interests, to keep the best for self, to keep the best for country. Hillary excelled at academics and has a great capacity for retaining information she deems is important. She is not only sharp and shrewd intellectually (Mars, Pluto and Scorpio influences), she also has an intuitive sense (9th house) regarding how to extract the most lucrative, meaningful or useful out of what there is to work with. She has proved herself to be poised, rationale, clear, controlled, and on point in debates and speeches. Hillary’s Ascendant/Descendant culminates with her karmic axis by one degree. It is another chart signature that can make the individual feel a sense of fated-ness to their life experiences and interactions with others. The south node is in Scorpio in the 1st house and in balsamic relationship to the 12th house planets (Sun, Chiron, Venus and Mercury station retrograde). Planets that are in balsamic relationship are both completing an evolutionary track and staging a future course. As stated above the 12th house concentration increases the attention on the individual’s completion of ultimate ideals, purpose, and potentials, while at the same time it marks her as a visionary with a special mission on behalf of the collective. Those with strong emphasis in the 12th house tend to be a step ahead of the rest. 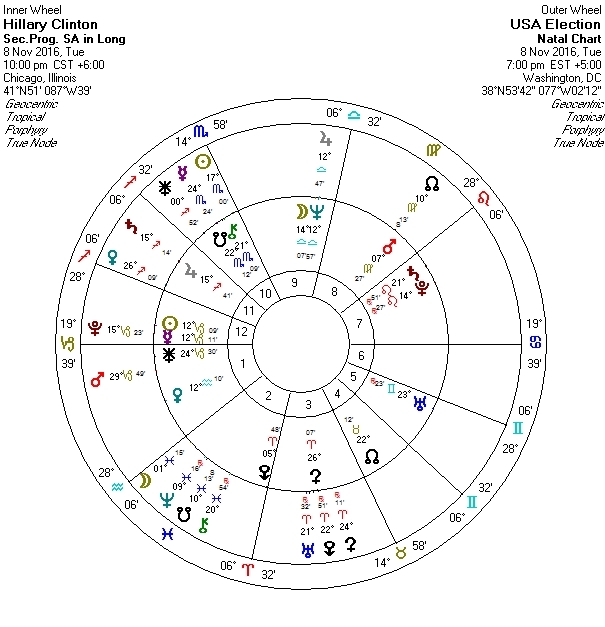 Relative to the Scorpio ruler in the 9th house, Hillary’s chart suggests she has an iconic lifetime to live, an iconic path of service to fulfill. Beyond her election as the first female to be president of the USA, there are and will be many more ways that the iconic nature of this lifetime will unfold. Mars, Pluto, and Saturn in Leo in the 9th house are square the north and south node, (the karmic axis). Evolutionary Astrology considers this configuration as a skipped step. It points to a key piece of evolution that has been previously visited, but that has not yet been well enough synthesized. It is of critical importance in terms of the soul’s evolution. When the karmic axis is found in the sign polarity of Scorpio/Taurus, it will suggest intense confrontation with matters to do with life and death, with sexuality, use and abuse, power, money and manipulation, undermining, entrapment, survival, and such. The resolution for the skipped step lies with the north node relative to Venus in Scorpio in the 12th, in first quarter square aspect to Mars/Pluto (action; decision maker; leader) and crescent square to Saturn (a builder/construction in progress influence). The north node ruler culminating with the south node is suggestive of prior experience/development/progress that is meant to be revisited and continued. Jupiter at 0 Sagittarius suggests a new level of freedom and a new level of courage, conviction and sense of righteousness accompanies her instincts in this lifetime. While she is reliving much, she is also on a fresh crusade, meant to transcend the losses, fixations, and self undoing of the past (12th house), and to use the experience and learning as a springboard for growth. Hillary’s was born under the gibbous lunar phase. (Sun: 2 Scorpio; Moon: 23 Pisces). Often those with a gibbous lunar phase feel they must always climb out from underneath a rock, that no matter how well they perform or show up, that still they must work harder than others to meet with approval, recognition, reward, and receive their accolades. The world tends to find fault or pick on their weaknesses, insecurities, imperfections, mistakes and such. Hillary has been criticized for the way she looks, for being too cold, for not being relate-able or trustworthy. She said many times during her election campaign that she knew public opinion was not in her favour, that there were many that who were conspiring to undermine her bid for the white house. The late announcement by the FBI only ten days before the election regarding renewal of their investigation into the private email server issue is yet another demonstration of how the gibbous lunar cycle tends to pile on extra work, problems and pressure. While there are some that hold to the opinion that Hillary has poor instincts, perhaps it is her gibbous lunar phase sets up conditions that allow for her to make “mistakes”, that force her to struggle, to work out a problem, this in order to increase awareness, to hone skills, to strengthen confidence in her own abilities, and to learn to trust herself better. Details:Transiting Sun surpasses first quarter square to Hillary’s 9th house Mars/Pluto on Nov 6 (-keeps email crisis & intensified battle/pressure going for Hillary through this date at least). Transiting Pluto in the 2nd house relative to Saturn in the 1st house. Hillary is given an opportunity to complete a long-in-the-works soul-mission (Mars/Pluto balsamic in the 9th). Note: Donald’s seventh house becomes the 10th house of the election day poll closing chart, thus elevating his 7th house. The Pisces transits in the 7th house (Neptune conjunct the south node; Chiron in Pisces) is indicative of the mass sentiment of disillusionment regarding the system that has catapulted Donald into public favour. Progressed Saturn on the Midheaven is fortuitous. Transiting Juno, the contract asteroid, forms trine aspect from the secondary progressed 2nd house. Transiting Saturn, also in the 2nd house, trines secondary progressed Mercury in Leo in the 10th house. 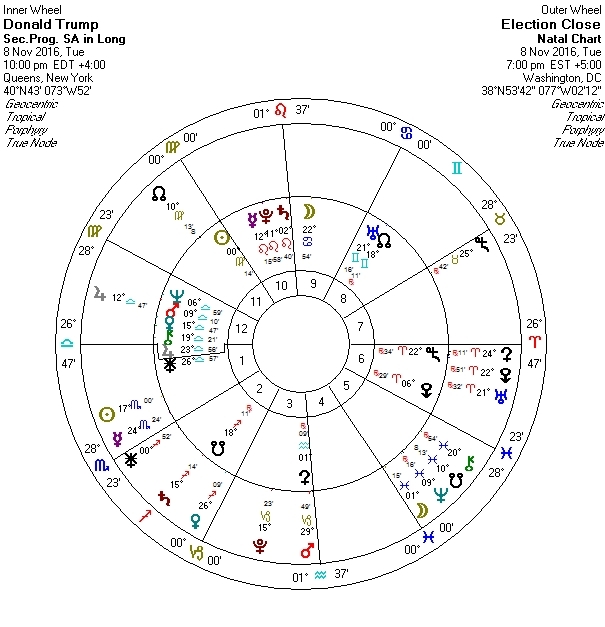 The transiting sun builds a first quarter trine aspect with Trump’s secondary progressed Moon. Despite his many blunders, Trump’s popularity throughout this election has surprised many. His progressed moon in Cancer in the 9th house is also a statement of public popularity and support. The 9th house can be one of “preaching to those already converted”. While he has said that if he loses this election, he will consider it as the greatest waste of his time, but in actuality, the campaign, despite the mudslinging, has done much to revive his public profile and bodes well for future opportunity.